On the evening of Friday 21st July, Junior Choir sang with 500 other children from 14 different primary schools at one of the Music Service Gala concerts in Symphony hall. We also had the opportunity to watch other musical ensembles- including the Birmingham Schools Jazz band and the Birmingham Schools Symphony Orchestra. We sang 7 songs that we have been practising at school and wore xylobands to create light effects when we performed our actions. 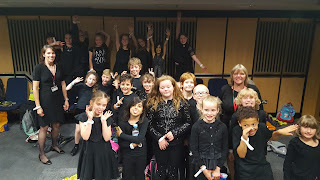 Everyone performed well and our choir were a credit to our school. Thank you very much to Mrs Rafter and Mrs Bundy who came with us and supported us so enthusiastically. On Monday the 17th July Year 1 children proudly displayed their fabulous homework projects. The pupil's task was to design and make their ideal garden. The children were free to show their work in anyway they liked, for example a poster, model or sculpture. Please see some of the wonderful examples below. The homework project was based around the children's current Topic of 'Insects and Flowers'. The children have been learning about plants, trees and mini beasts and their habitats. Thank you to parents for their support in undertaking the project and the Year 1 staff were pleased to see lots of parents come to the exhibition after school. The children really enjoyed showing their work to friends and family. We have had a jam-packed and fun week so far that started with Bollywood dancing on Monday, Nursery AM had sports day on Tuesday and we had a visit from Tom Foster, a Paramedic. We even got to go in the ambulance and turn on the sirens! On Wednesday we made fruit faces (briefly, before eating the lot!) Still lots to come. YEAR 5 BAKE IT CELEBRATION!! !